The movie that every one has been waiting for that will renew the rivalry between Princeton and Rutgers! 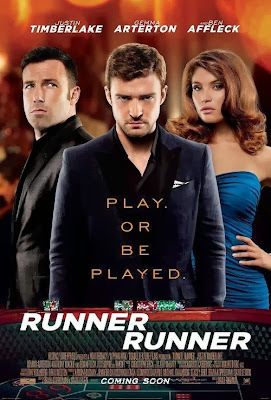 Runner Runner is your fun to watch movie with a story that is difficult to swallow. Justin Timberlake plays a number crunching nerd, Richie Furst, who refers people to an online betting site to earn money for his Princeton graduate degree. When time is running out on him due to pressures from the school he bets his life savings for a quick payout. When he loses everything due to a statistical anomaly he flies to Costa Rica to confront the owner of the site, tycoon Ivan Block (Ben Affleck aka Batman). When he confronts the tycoon, which he easily gets to without effort. Ivan eventually thanks him and offers him a job. Things of course are always not as they seem. The main leads in the movie are all wonderful in their role. Charismatic and easy on the eyes, especially Gemma Arterton whom I loved in Hansel & Gretel. The pacing of the movie is good as time flies by quickly. But the story as I said before is just unbelievable. How easily Richie got to Ivan is such a bit of a stretch. To imagine you can become Warren Buffet's friend and top right hand man in just a few days would be most people's far fetched dream of winning the lotto twice in a week and becoming a starting quarterback for a NFL team. In addition, the dialogue is amusing but difficult to understand at times. This is especially true when Ben Affleck is speaking. His lines are sometimes just muttered out as if he was just ad-libbing. I'm usually a big fan of Anthony Mackie, but his talents are just wasted in this film with a generic role that doesn't fully let his acting chops shine. Overall, I would still recommend this film especially if you're a fan of Justin Timberlake. The end as you would expect from this movie is a feel good ending. A little bit predictable for me, but still enjoyable.